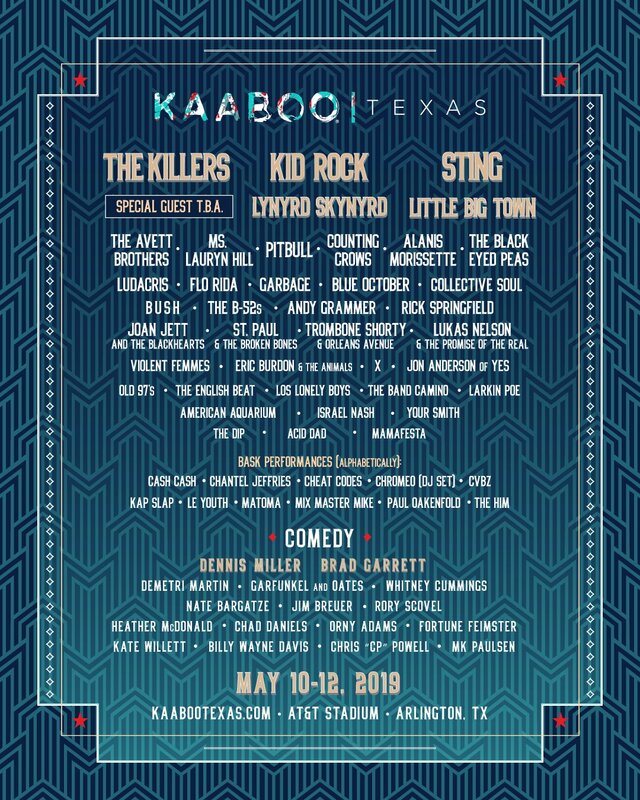 KAABOO Texas, a three day indoor / outdoor fiesta of live music and comedy, will take place from May 10 - 12th, 2019 at the state-of-the-art AT&T Stadium in Arlington, Texas. Featuring an impressive six stages and forty artists, everyone is sure to find something they love. “We want to bring what we do best in the festival world and put a Texas-sized spin on it. You won’t find yourself sitting in seats for too long here, because you won’t want to miss a minute of the action,” said Jason Felts, Chief Brand and Marketing Officer for KAABOO. The festival is thrilled to announce its 2019 lineup, which is chock full of chart toppers spanning rock, pop, country, and folk. Headliners include American rock quartet The Killers, timeless legends Kid Rock and Sting, and southern big-shots Lynyrd Skynyrd and Little Big Town. They will be joined by The Avett Brothers, Ms. Lauryn Hill, Pitbull, Counting Crows, Alanis Morissette, The Black Eyed Peas, Flo Rida, Joan Jett and the Blackhearts and many more. In addition to the outdoor music scene, KAABOO offers an indoor, air conditioned, and seated comedy club called HUMOR ME. Here, attendees will find kings of comedy such as SNL cast alum Dennis Miller and Everybody Loves Raymond’s Brad Garrett. The hilarious Demetri Martin, Garfunkel and Oates, Whitney Cummings, Nate Bargatze and many more round out the weekend. Sit back and relax (or fall out of your chair) with these nationally recognized entertainers. ARTWORK plays host to a variety of contemporary public art installations featuring both local and international artists. Whether completed beforehand or created live during the event, each piece provides a unique journey of awe and delight. If interested in owning a piece of KABOO, a gallery of artwork available for purchase can be found here. Proving that KAABOO is a feast for all senses, PALATE indulges guests with local and regional delicacies from a variety of culinary masters. Sure to satisfy any craving, pair your good eats with dozens of limited production wines and craft beers. After a long fun-filled day, enjoy a full spectrum of famous INDULGENCES: a hair blow-out, fashion consultation, or gentleman’s hot shave, just to name a few. In addition to traditional spa services, don’t miss out on exciting treatments - like IV nutrient therapy, proclaimed to be the ultimate hangover cure. Finally, nightlife is kept alive at BASK, presented by Coors Light. At KAABOO’s signature Vegas-style day + night club, guests can escape to a private cabana, rock out to their favorite DJ from the pool, or enjoy cocktails and yard games. The lineup includes internationally acclaimed Cash Cash, Chantel Jeffries, Cheat Codes, Chromeo (DJ Set), CVBZ, and many others. KAABOO believes local charities have a major impact within a community, and has paired with KINDNESS to give back to focus on helping causes in the Arlington/Dallas area. One dollar of every pass sold by KAABOO will be distributed among their community partners, such as MusiCares, which helps those affected by the devastation of recent hurricanes.